There are only 20 spots to honor great performances at the Oscars, with arbitrary classifications between lead and supporting roles. But there’s plenty of acting to celebrate, and a lot of these roles probably won’t be honored. So consider this a thank you note to these actors and a For Your Consideration notice to the Academy. While I haven’t seen everything 2014 had to offer (Birdman is the one I’m kicking myself most for missing), here are the five best performances by men and the five best by women. As the revenge-obsessed but woefully unprepared Dwight in Jeremy Saulnier’s brilliantly crafted thriller Blue Ruin, Macon Blair gives one of the most natural performances of the year. Dwight displays both tremendous cunning and unbelievable stupidity, sometimes in the same scene. Throughout, Blair gives Dwight a real humanity, even when he’s doing inhumane things. While Patricia Arquette and Ethan Hawke are getting plenty of well-deserved praise for Richard Linklater’s opus, this movie would completely fall apart had Linklater not discovered the one-in-a-million Ellar Coltrane, who makes Mason so utterly believable and relatable over the 12 years of filming. 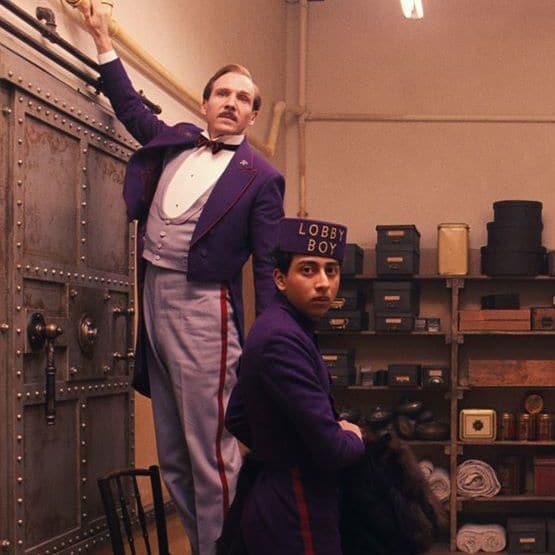 Miles away from his most famous roles as sadistic villains in Schindler’s List and the Harry Potter series, Ralph Fiennes cuts loose as the amorous concierge of one of Europe’s swankiest hotels in Wes Anderson‘s terrific comedy. While he possesses a rapier wit that he sometimes uses on his friends without realizing it, Gustave H. is a man who deeply respects other people, at least until they disrespect him. There’s something both disturbing and enthralling about Louis Bloom, the would-be reporter Jake Gyllenhaal plays in Nightcrawler. Like the deadly car crashes he covers, you want to look away but can’t. While already somewhat sociopathic, Louis goes deeper and darker the further he gets into the underworld. His dinner scene with his boss (Rene Russo) is even more troubling than the grisly murders Louis films. Like R. Lee Ermey in Full Metal Jacket, J.K. Simmons’ Eugene Fletcher is not interested in any of his charges’ self-esteem. He’s strictly there to break them down. There’s a menacing glee in his eye every time he hurls a barb (or a chair) at a young musician he hopes to mold into the next Charlie “Bird” Parker. His methods are brutal, but depending on your reading of the film’s ending, you can’t argue with the results. It should not be surprising to anyone that unless you’re Meryl Streep, there are hardly any well-written roles for women over age 40. So it’s terrific that there’s a role like this, and even better that Patricia Arquette is giving the performance of her career. As Mason and Samantha’s struggling single mother, she’s both deeply committed to her children, protecting them every step of the way, but somehow oblivious to the destructive men in her life. But the movie’s not judgmental in the slightest, but Arquette clearly expresses all the joy and pain of motherhood and a time that went by far too quickly. I’ll make a strong case that Jessica Chastain is the best actress working today. Exhibit A: Her performance in the titular role, giving depth and feeling to a character that’s sometimes underwritten. Eleanor is a difficult woman, who refuses to acknowledge or discuss her recent suicide attempt, no matter how many people try to help her. She forges ahead on her own, moving through the fog with the help of her professor (a terrific-as-usual Viola Davis). It’s a challenging role in a challenging film, and Chastain accepts it, and crushes it. Without spoiling anything, Rosamund Pike makes every insane twist in Gone Girl completely believable. As Amy Dunne, the missing wife of Nick (Ben Affleck), she’s angelic but coarse, trustworthy but suspicious, and smart but foolish. As has been pointed out by other critics, none of America’s sweethearts could have played a role this dark. Rosamund Pike, who started out poorly as a Bond girl in Die Another Day, has turned her career around and given one of the most talked-about performances of the year. Best known for her cameos on Parks and Recreation and being “that girl who dropped the F-bomb on Saturday Night Live,” Jenny Slate finally gets a role that fits her comic gifts. As a struggling stand-up in New York, Slate’s Donna is a woman uses jokes about her period and bowel movements to cover up feelings of inadequacy and disappointment. After a chance encounter with a non-douchey guy (and the subsequent unplanned pregnancy), Donna has to grow up quick, but Slate allows her to kick and scream along the way. It makes the whole thing more adult, even when she acts like a child. “This is Size 10 chaos!” Mason bellows to the rear cars of a train traveling around the frozen world of the future. Through buckteeth and Coke-bottle glasses, Tilda Swinton turns in another amazing performance, playing the easily manipulated disciplinarian of the mysterious conductor of Snowpiercer. She’s the wildest part of a wild film, the best science fiction of the year.